As well as a striking and memorable theme for your exhibition, we can help you carry that message across every available channel to support your presence at the exhibition - and maximise the impact of your budget. Hullabaloo is a full service design studio that works as happily in print as it does in digital communications. But what does that mean for you? It means we can support you whatever medium you wish to use, and help you decide what the best route is for you - digital or printed. Hullabaloo delivers creative, professional exhibition design solutions that can be easily and cost effectively transferred from one medium to another. We'll show you how to achieve more with your exhibition and help you decide the best way to deliver optimum benefit for your budget. Hullabaloo is located in Leicester, Leicestershire, central to the Midlands. One advantage of being based in Leicester, is the ease of travel to and from almost anywhere in the UK. We always value meeting in person to discuss the potential direction of your exhibition, and being central to the country means that no client is too far away, and milestone meetings are easily arranged to make sure your exhibition is delivered on time and on budget. We work well with your own stand contractors - or if you prefer we can arrange that for you, and wherever you are based our central location makes for easy distribution, meaning that there is no problem in getting your support materials to you in a timely fashion and to meet your deadlines. When a space became available at the last minute, we were asked to design and deliver the stand for Rocwool. 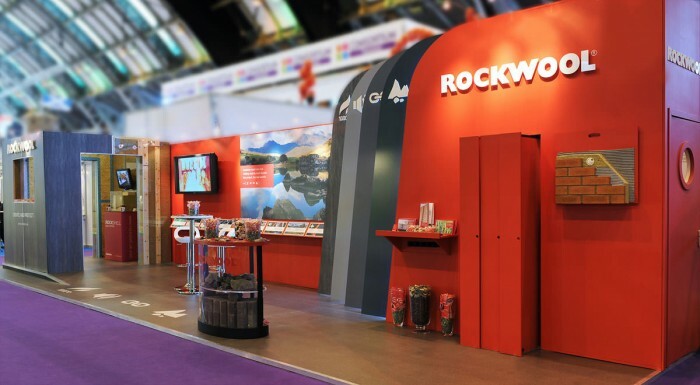 The bespoke exhibition was designed to reflect the flexibility and effectiveness of Rockwool’s range of products, and was built almost entirely from their materials. Announcing the news that ASSA ABLOY would no longer be selling locks under the famous Chubb brand required careful management. 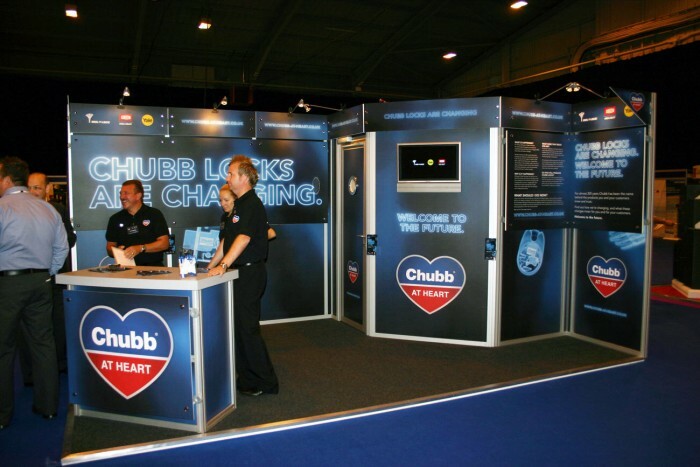 Launched at one of the lock industry’s leading events, this exhibition and supporting materials helped make sure that key people got all the facts. We will meet with all the key decision makers (and even your clients if you wish) to understand their views, and find what each of them wants from your exhibition. Having talked to the key people, we go away and produce a range of ideas of how we could achieve the brief’s objectives. This will include a choice of themes for the exhibition that can be carried across a range of communications. The concepts will show how each option would work on the stand itself, Audio Visual presentations, printed materials, PDFs and even online apps – all the factors that go to make an engaging and effective exhibition presence. Once we are all agreed on a direction, we work with your event team to finalise the structure and content and make your exhibition a success. From helping plan the content and how to deliver it - to copy writing, photography & illustration - we help you bring together all the elements into an electronic or paper outline that lets you see how your stand and supporting materials will look and work, and make sure it’s exactly right before we proceed to production. From there we work alongside your event team to produce the final stand in whatever form we have agreed - and put copies of them onto our secure web space so that you can check everything is saying exactly what you want it to say before approving it to go live. Creating your exhibition is just the start. Hullabaloo can help find innovative and effective ways to take your exhibition message to all the right people - and achieves your objectives. Beyond your exhibition, your team will need to be supported. Hullabaloo is a full service design studio that works as happily in print as it does in digital communications - so whatever you need, we will be delighted to help. We would love to meet and talk about your exhibition design - or any specific projects you are planning.